Environmental considerations will increasingly determine use of macro algae product and improve process acceptability that drive the next generation of economic opportunity. Some countries including Japan are actively promoting a macro algae ‘green’ technology that is many growing demand worldwide in the coming decades. In this context, biomass refer to any source of heat energy that is produced from non-fossils biological materials. Different macro algae survive in different habitat. 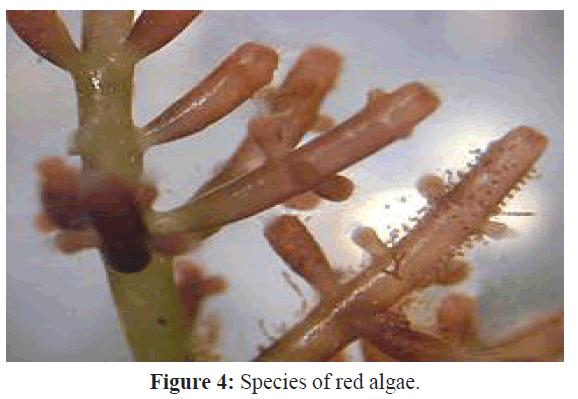 This paper describe review of macroalgae species as well as qualitative and quantitative experimental analysis of the types of macro algae which are suitable cultivation in Malaysia water. This approach would identify the oceanic parameters that are most suitable for the macro algae and conduct species matching. The use of algae include food production of useful compounds for food supplement, as bio filters to remove nutrients and other pollutant from wastewaters, to record water quality, as indicators of environmental change, in space technology, and as laboratory research systems. Algae can also be use to make biodiesel and biobutanol can produces vastly superior amounts of vegetable oil, it is prefer to compared terrestrial crops grown for same purpose. It also can be used to produce hydrogen. Marine macro algae are receiving increasing attention as an attractive renewable source for producing fuels and chemicals. Marine biomass energy sources although heavily subsidy as renewable energy sources. Macro algae species are very abundant in earth and they have high caloric energy value compare to other biomass sources. In addition to this, the biomass can also be use for carbon capture. The carbon capture is an approach to mitigate the global warming by capturing the carbon dioxide from the large point sources such as fossil fuel power plants and storing it instead of releasing it into atmosphere like technology for large scale capture of CO2 is already commercially available and fairly well developed. This study focuses on matching the macro algae species with the habitat in Malaysia water and identified the most suitable types of macro algae that can be for marine biomass energy source. The work access the species of biomass in Malaysia and geographical location of where to find the macro algae species. The assessment is conducted by analyzing the sea water in certain habitat of seaweed in Malaysia. The study focused on element which is sea water analysis, energy value and carbon sink test for power and emission from biomass species. i. 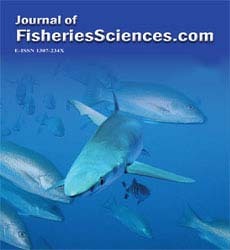 Sea water analysis: The water analysis was involved mapping the biomass species and identifies the location of their growth. Water samples were collected during the same month from different location that is BidongIsland, Setiu Wetland and PerhentianIsland. Since several places are involved, each water sample analysis is taken at different time. The water samples are stored in dark plastic bottles and kept at the sampling not longer that six hours before filtered by hand operated vacuum pump. ii. Caloric energy value and carbon sink: Biomass energy extracts carbon to reduce the carbon stocks. The carbon sinks remove carbon dioxide from the atmosphere. The main natural sinks are absorption of carbon dioxide by the oceans via physicochemical and biological processes and also photosynthesis by terrestrial plants. iii. Calculate for power efficient and emission from biomass species: The power efficient is identify by testing biomass oil in the engine. Biomass energy reduction in the emission of atmospheric pollutants compared to conventional power sources would be investigated. The state of Terengganu is located on the east coast in Peninsular facing the South China Sea. 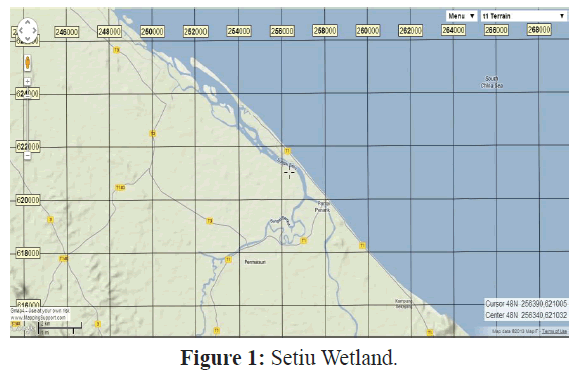 Three location of sea water in Terengganu are taken as sampling site in order to identify the habitat species of algae which is Setiu Wetland, Bidong Island and Perhentian Island. Setiu Wetland is the part of Setiu River Basin and the larger Setiu-Chalok-Bari-Merang basin wetland complex lies in Terengganu. It is located at 05o 40N and 102o 43’ E.
The water samples were takes in Setiu Wetland,Bidong Island and Perhentian Island. The 200 meter depth is marks on the rope at the vandorn water sampler. The latitude and longitude at the location was identified using the Global Positioning System (GPS). The GPS was set up assuming 500 meter distance from the shore. The water samples are transfer into immediately bottles after takes using vandorn water sampler to prevent the distruption of surrounding. the most suitable for macro algae survive is about 29-32°C. Two different times are taken which is at 11.00am and 3.00pm. So, four different of water samples are taken. The location of Setiu wetland are N 05o 40.540’ E102o 43.080’ and N 05o 40.313 E 102o 43.934’. Temperature of water samples was taken a moment after exchange the samples into the bottles.The water temperature is 32oC. 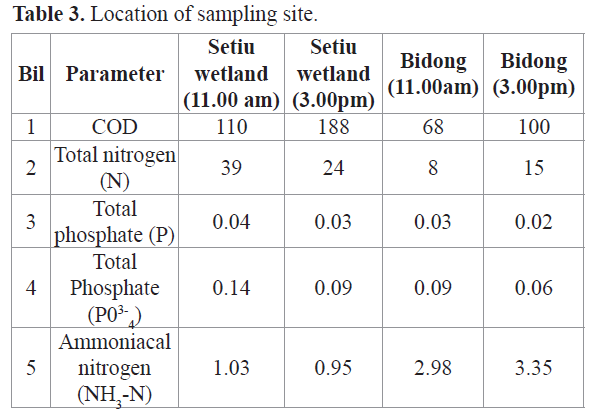 This figure show the location of Setiu Wetland where the water samples are taken (Table 1 and Figure 1). Table 1. 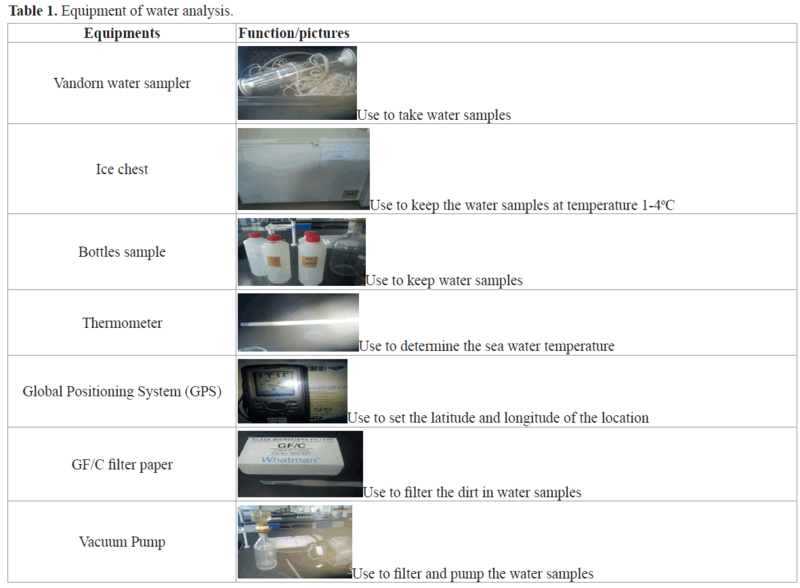 Equipment of water analysis. Bidong Island is one square kilometer in area and accessible from the coastal town of Merang. It is located at 05o 36 N and 103o 03 E. At the Bidong island also takes two times samples, in 11.00am and 3.00 pm. Four collected of water samples taken and the temperature were identified. It is located 05o 36.828 N and 103o 03.262 E. The water temperature is 31oC. This figure show the location of Bidong island where the water samples are taken (Figure 2). Perhentian Island is divided by two which is Perhentian Kecil and Perhentian Besar. The sampling site is at Perhentian Kecil with located at 05o 51 N and 102o44 E. Two different times are taken which is at 3.00pm and 10.00 am on the next day. The location of Perhentian Island is 05o 21.26 N and 102o 44.2 E and the water temperature is 29oC. 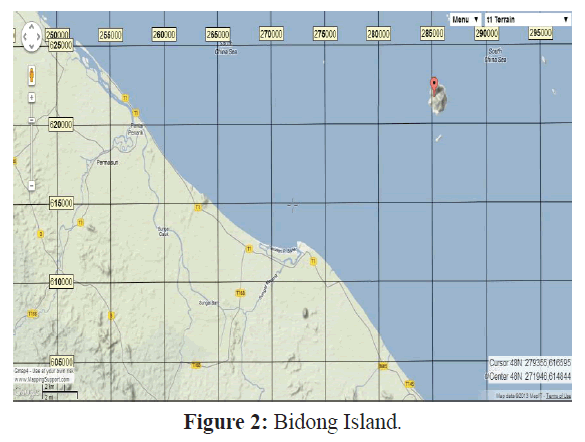 This figure show the location of Bidong island where the water samples are taken (Figure 3). Macro algae have four different types, which is Rhodophyta, Chlorophyta, Phaeophyta and CarpoCirus. Rhodophyta is the red algae that include various forms of crustose calcareous algae CCA which are abundant on offshore reefs of the Great Barrier Reef. The red algae or Rhodophyta shown in Figure 4, are one of the oldest groups of eukaryotic algae and also one of the largest with about 5000-6000 species of mostly multicellular marine algae. The red algae form a distinct group characterized by these attributes which is eukaryotic without flagella and centriols, using florideanpolysaccharide as food reserves with phycobiliprotein as accessory pigments and chloroplasts lacking external endosplasmic reticulum and containing unstacked thylakoids. Most of red algae are also multicellular, macroscopic, marine and have sexual reproduction. They often have alternation of generations and may have three generation rather than two. Many of the corraline algae, which secrete calcium carbonate and play a major role in buiding coral reefs belng here. Red algae such as Palmanari palmate and nori are a traditional part of European and Asian cuisines and are used to make other products such as agar, caarageans and other food additives. Most of the Rhodopytes are found in freshwater that generally prefer clean and in running water. Figure 4: Species of red algae. Chlorophyta species is a division of green algae, informally called chloropytes. In order to classification systems, it refers to a highly paraphytetic group of all the green within the green plants and thus includes about 7000 species of mostly aquatic photosynthetic eukaryotic organisms. Like the land plants, green algae contain cholorophyllsa and b and store food as starch in their plastids. Species of Clorophyta are common inhabitants of marine, freshwater and terrestrial environment. Several species have adapted to specialized and extreme environments such as deserts, arctic environments, hypersaline habitats, marine deep waters and deep sea hydrothermal vents. Some groups such as the Trentepohiliales are exclusively found on land. Several species of Chlorophyta live in symbiosis with a diverse range eukaryote, including fungi to form lichens, ciliates, Foraminifera, Cnidaria and mollucs. Some species of chlorophyta (Figure 5) are heterotrophic, either free-living or parasitic. The heterotrophic green alga Prototheca can cause infections in humans and animals known as protothecosis. Figure 5: Species of green algae. The Phaeophyta or brown algae is a large group of mostly marine multicellular algae, including many seaweeds of colder Northern Hemisphere waters. They play an important role in marine environments, both as food and for the habitats they form. For instance Macrocystis, a kelp of the order Laminaries, may reach 60m in length, and forms prominent underwater forest. Another example is sargassum, which creates unique habitats in the tropical waters of the Sargasso Sea. 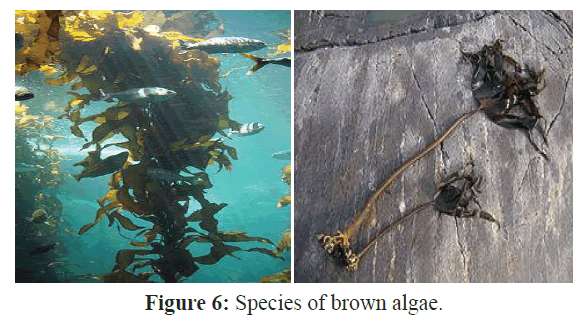 Many brown algae shown in Figure 6, such as kelp are used as food for humans. Brown algae exist in a wide range of sizes and forms. The smallest members of the group grow as tiny, feathery tufts of threadlike cells no more than a few cm long. Some species even have a stage in their life cycle that consists of only a few cells, making the entire alga microscopic. Other groups of brown algae grow too much larger sizes. Kelps can range in size from two-foot-tall sea palm Postelsia to the giant kelp Macrocystispyrifera which grows to over 45m long and is the largest of all the algae. Figure 6: Species of brown algae. Brown algae have adapted to a wide variety of marine ecological niches including the tidal splash zone, rock pools, the whole intertidal zone and relatively deep near shore waters. They are important constituent of some brackish water ecosystem and four species are restricted to life in fresh water. A large number of predominantly cool and cold water organisms that benefit from nutrients in up welling cold water currents and inflows from land, Sargasum being a prominent exception to this generalization. As world energy demand continues to rise and fossil fuel resources are depleting, marine macroalgae (i.e., seaweed) is receiving increasing attention as an attractive renewable source for producing fuels and biochemical. Product marine plant biomass has many advantages over terrestrial plant biomass for example they are use as a feedstock. Recent breakthroughs in converting diverse carbohydrates from seaweed biomass into liquid biofuels for example bioethanol through metabolic engineering have demonstrated potential for seaweed biomass as a promising, although relatively unexplored according to biofuels (Na Wei, 2013). Marine biomass energy system in Japan was proposed consisting of seaweed cultivation (Laminariajaponica) at offshore marine farms, biogas production via methane fermentation of the seaweeds, and fuel cell power generation driven by the generated biogas. The estimated CO2 mitigation is equivalent to about 0.9% of the required CO2 mitigation for Japan per annum under the Kyoto Protocol framework (Shinya Yokohama, 2008). Brown macro-algae that commonly found around the British coasts are mainly used as a source of many useful industrial chemicals such as phycocolloids (e.g. alginates). Conversion of macro-algae into biofuel has largely focused on the production of biogas by anaerobic digestion (Hanssen et al., 1987; Hansson, 1983; Matsui and Koike, 2010).Some recent studies have focused on the utilization of the sugars present in seaweed (mannitol and laminarin for brown algae) in order to produce bio-ethanol by fermentation (Adams et al., 2009; Choi et al., 2009; Horn et al., 2000). Marine macro algae are one such source of aquatic biomass and potentially represent a significant source of renewable energy. The average photosynthetic efficiency of aquatic biomass is 6–8% (Renewable biological systems for alternative sustainable energy production, 1997) which is much higher than that of terrestrial biomass (1.8–2.2%). Either microalgae or marine macro algae (kelp or seaweed) could be used for solar energy conversion and biofuel production. (A.B. Ross, 2007). Brown macro algae that commonly found around the British coasts are mainly used as a surce of many useful industrial chemicals such as phycocolloids (eg alginates). Conversion of macro algae into biofuel has largely focused on the production of biogas by anaerobic digestion (Hanssen et el, 1987; Hansson, 1983; Matsui and Koike, 2010). Some recent studies have focused on the utilization of the sugars present in seaweed (mannitol and laminarin for brown algae) in order to produce bioethanol by fermentation (Adams et al., 2009; Choi et al. ; Horn et al., 2000). Biomass, either terrestrial or aquatic, is considered a renewable energy source with quasi zero-emission. Among alternative energy sources, biomass represents the most ready to be implemented on a large scale without many environmental or economic penalty. The photosynthetic efficiency of aquatic biomass results to be much higher than 6–8%, average compare to that of terrestrial (1.8–2.2%, average). This makes the former more adapt for an enhanced CO2 fixation to afford a high biomass production. Also, aquatic biomass presents an easy adaptability to grow in different conditions, either in fresh or marine waters, and in a wide enough range of pH. The pond culture of algae presents the advantage of usage of carbon dioxide emitted by electric power plants, using of wastewater that may supply the amount of required nutrients. Micro-algae have received so far more attention with respect to macro algae as agents for enhanced CO2 fixation due to their facile adaptability to grow in ponds or bioreactors and the extended knowledge on several strains used for fish feeding. Only recently they have been considered for energy production, and the potential of some Pacific Ocean strains has been preliminarily studied (M. Aresta et al., 2005). While the general idea of using algae for energy production has been around for over 50 years, the concept of using lipids derived from algal cells to produce liquid fuels arose more recently. (Ayhan Demirbas,2010). According to the Michele Aresta, (2005) macro-algae are extensively grown and used as food in Asiatic Countries, or as source of chemicals. They are usually collected from natural water basins where they are seasonally available. Only recently they have been considered for energy production, and the potential of some Pacific Ocean strains has been preliminarily studied. The Life Cycle Assessment (LCA) methodology has been applied to evaluate the energy production from macro-algal biomass. We have developed specific software (COMPUBIO) which can be used for an energetic, environmental or economic evaluation. Needless to say, the world population is increasing at an alarming rate and so is the liquid fuel demand in the transport sector. Global warming, depletion of fossil fuels and increasing price of petroleum-based fuels are gaining great concern and the exigency of the situation has forced the search for alternative, sustainable, renewable, efficient and cost-effective energy sources with lesser green house gas emissions (Nigam and Singh, 2010). Biomass can serve as an excellent alternative source to meet the present and future fuel demands. The use of seaweeds for food and as medicines was recorded in China some thousands of years ago, and in parts of Asia seaweed products have for many years been widely used, if not staple, food items. In the western world seaweeds have traditionally been valued principally for their properties as animal feed and fertilizers and, during the eighteenth and nineteenth centuries, as a source of soda, iodine and other chemicals. (Darson,1966). The underlying physiological of algae antioxidant compunds is reviewed in the context of seaweed biological utilization. The application of seaweed antioxidants in foods, food supplements, nutraceutical and medicine is considered form the perspective of benefits to human health. We advocate that direct consumption of seaweed products for their antioxidant composition alone provides a useful alternative to non-natural substances, while simultaneously providing worthwhile nutritional benefits. 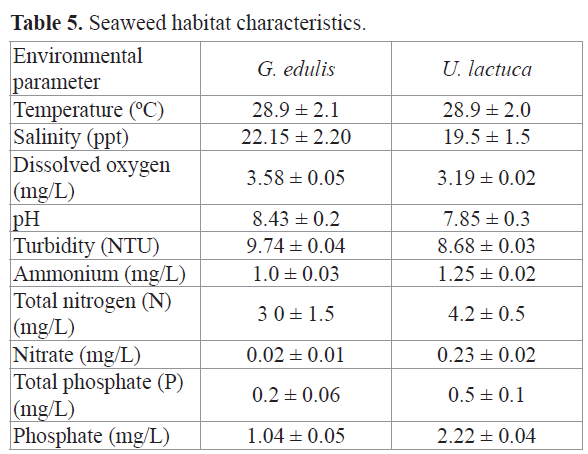 Economic utilization of seaweed for their antioxidant properties remains in its infancy. This review examples ranging from laboratory studies through to clinical trials where antioxidants derived from seaweeds may provide majr health benefits that warrant subsequent investigate studies and possible utilization (M. Lynn Cornish, 2010). The influence of salinity and temperature in the areas of planned wind farms will not vary extensively and will be similar at all locations while remaining at all times in the tolerance to optimum range of the culture candidate species (AlmadeVillela et al. 1982, Widdows and Donkin 1992, BSH 2003). The concentrations of pollutants (e.g. heavy metals, pesticides and near-surface agents) can be considered unperilous. Besides geological and topographical variations, water temperature and currents have also caused differences in macro algae composition between the northern and southern parts of the Pescadores and Taiwan. The two main currents affecting the coastal areas of Taiwan are the Kuroshio Current and the Mainland Coastal Current. The Kuroshio Current brings water of higher temperature and salinity up from the Philippines and the equatorial regions toward southern Taiwan where it branches into two. The stable, main branch with higher that 20oC water temperature runs past the east coast of Taiwan where some tropical species are found. A smaller branch, subjected to seasonal variability, veers northwestward through the Taiwan Strait to the southern parts of the Pescadores. Flowing south along the Chinese mainland coastal region, the Mainland Coastal Current carries colder water from East China Sea to the northern parts of Taiwan Strait, and is particularly strong in summer and less so in winter. Typhoons also occur disturbing the coastal areas every year and have caused considerable damages to marine ecosystems (Jui-Sheng Chang and Chien-Chang Tseng, 2010). Water sample are collect using vandorn water sampler and transferred to the bottle samples. Generally, at least one liter of water sample is needed. Sample volume is depending on the sampling location. The water samples are kept from heat and light to avoid pigment decomposition and bacteria infect. The location of each sampling sites are marks using GPS and the temperature of sea water is taken immediately to prevent surrounding disturbance. Hence, the water samples are place in an ice chest at temperature 1-4 oC. Table 2 shows the coordinate for Perhentian, Setiu and Bidon Highland. Tables 3 and 4 shows respective nutrient condition of the water sample collected the sites. 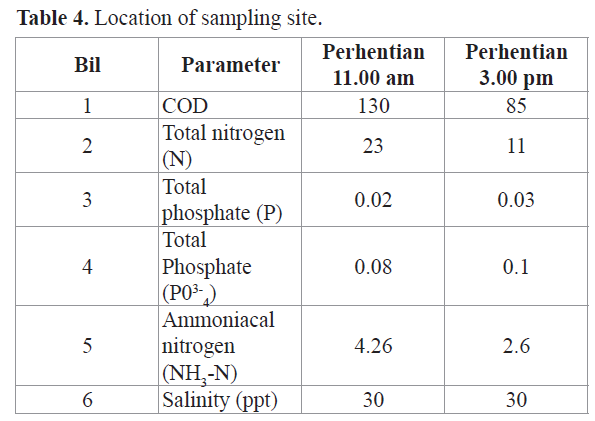 Table 5 shows typical seaweed identifies at Setiu location. Table 2. Location of sampling site. Table 3. Location of sampling site. Table 4. Location of sampling site. Table 5. Seaweed habitat characteristics. The GF/C filter paper is set up onto the vacuum pump. The water sample is gently poured into the vacuum pump trough GF/C filter paper after switch on the vacuum pump. The sediment in water sample is ensure filtered with checking the filter paper if there is has clog or not. Experiment was set up in the laboratory to identify the nutrient contains in the seawater which suitable for types of macro algae. There are four nutrients that may identify using these experiments which is nitrate, phosphate, nitrogen and ammonia (Figures 7-11). Figure 7: Ammonical - Nitrogen Concentration (mg NH4Ã¢ÂÂ»N/L). Figure 8: Phosphorus Concentration (mg PO43¯¬P/L). Figure 9: Phosphorus Concentration (mg PO4³¯ P/L). Figure 10: Total moisture content. Macro algae may found in many types of habitat in Malaysia such as Bidong Island, Redang Island, Perhentian Island and Setiu Wetland. The use of macro algae as the marine biomass energy sources has the potential to offset substantial use of fossil fuels. The net emission of carbon into the atmosphere can be reducing due to use the macro algae as biomass energy sources. Singh,S.K.,SeemaSrivastava., (2008). A Textbook of Algae. Campus Books International 313-322. Nisizawa, K.,Noda, H., Kikuchi, R., Watanabe, T., (1987).The main seaweed foods in Japan.Proc Intl Seaweed Symp12 :5-29. Chiang, Y.M., Wang, W.L., (1987).Distribution of seaweed of the Hengchun Peninsula, Taiwan.K. H. Chang (ed), Marine science. National Science Council Symposium Series 10 :71-87. Indergaard, M., Minsaas, J., (1991).Animal and human nutrition. In Guiry, M. D. Blunden, G. (Ed.) Seaweed Resources in Europe: Uses and Potential. John Wiley & Sons, Chichester21-64. Janet R. S., (1973). Handbook of Physicological Methods. Press Syndicate of the University of Cambridge. Haug, A., Jensen, A., (1954). Seasonal Variations on the ChecmicalCopmosition of Alariaesculenta, Laminariasaccharina, Laminariahyperborea and Laminariadigitata from Northern Norway. Reports of the Norwegian Institute of Seaweed Research No. 4. Chang, J.S.,(2002). The Taxonomy, life cycle and seasonal growth of Vodium and its effect on coral communities in Nanwan Bay, southern Taiwan.Ph.D dissertation, the Institute of Oceanography, National Taiwan University, p. 144. Guillermo D.P., Laurence J., McCook (July 2008). Macroalgae (Seaweeds). Environmental Status.Australian Government Great Barrier Reef Marine Part Authority. Jensen, A., (1956). Component sugars of some common brown algae. Rep. Norw. Inst. Seaweed Res. No. 9. Jensen, A., (1956).Preliminary investigations of the carbohydrates of Laminariadigitata and Fucusserratus.Rep. Norw. Inst. Seaweed Res. No. 10. Morgan, K.C., Wright, J.L.C., Simpson, F.J., (1980). Review of chemical constituents of the red alga Palmariapalmata (dulse). Econ Bot 34 :27-50. Arasaki, S., Arasaki, T.,(1983). Vegetables from the Sea. Japan Publ. Inc., Tokyo. Baardseth, E., (1970).Synopsis of biological data on knobbed wrack Ascophyllumnodosum (Linnaeus) Le Jolis. FAO Fisheries Synopsis 38 :1-38. Dawson., (1966).Fisheries and Aquaculture Department: Production, Trade and Utilization of Seaweeds and Seaweed Products. Retrieved from http://owl.english.purdue.edu/owl/resource/560/10/.